As 2012 ends, NewscastStudio is taking a look back at the year that was in set design, highlighting some of the trends we noticed. What trends have you noticed in set design? Sets continued the trend of becoming composed more of right angles and straight walls, as opposed to the voluptuous curves that dominated the TV news landscape for years. Curves, when used, have tended toward the more gentle. Even diagonal angled walls have fallen out of favor on new sets being built. These angles were a standby on smaller local news sets, but even these types of environments are using squared off corners more and more. Here again, if angles are used, they tend to be more subtle. Driving this trend is the more sleek, contemporary feel that has been penetrating the United States set design scene, something that’s been a mainstay of European design for years. 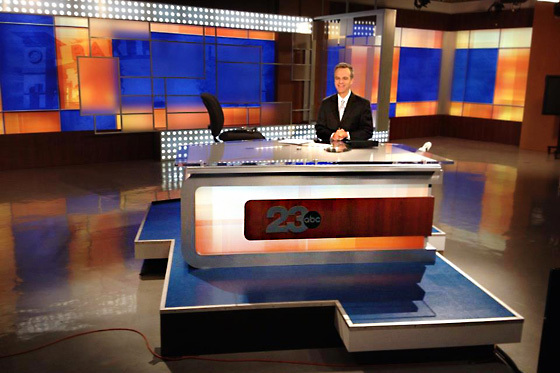 Another trend that continued in 2012 is the reduction of utilizing printed graphics on sets. 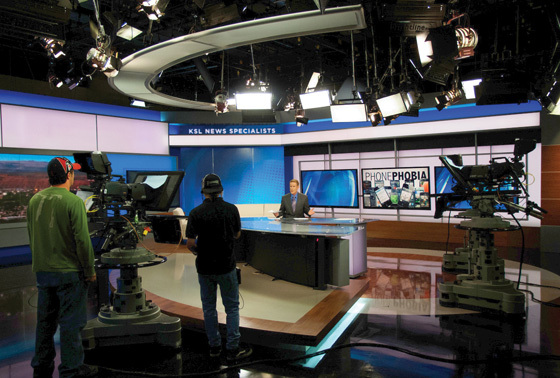 For years, large format printed graphics were found on almost every TV news set. 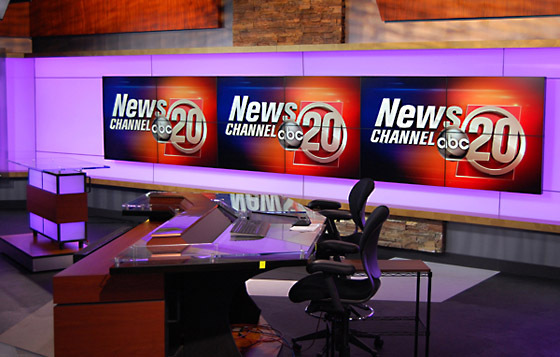 These backgrounds gave stations the opportunity to incorporate local imagery and their branding behind talent in an affordable and colorful manner. The use of these durtran backgrounds has steadily been declining on new sets being installed. Instead of printed graphics, backlit color changing LED walls are becoming more and more popular, even in smaller markets, marked by the lowering of the price points on the technology. As a result, studio walls are becoming cleaner and relying more on the color changing properties and flat panel monitors to drive visual interest. With the move away from printed backgrounds, textured elements have popped up on many recent sets. Designers are working hard to incorporate the “feel” of the city while making the set unique. Glass has always been popular, but now copper and brushed aluminum are making appearances. Interestingly, the look and feel of the old style rear projection cube walls of the late 1990s and 2000s is back, though this time powered by flat panel LCD or LED screens. During the past year or so, the prices on low or zero bezel flat panels has come down, making them more affordable, especially in large arrays. That said, no matter how “low profile” a monitor purports to be, these arrays still have the telltale seams between each monitor, a look that had fallen out of favor for several years with the use of rear projection screens with single spans. Flat panel video walls and arrays offer several advantages to rear projection, including the fact they are easier to light and don’t require the extra space needed for the projection cone behind the set. As video walls gain favor over printed graphics, another practice that’s becoming more popular is the use of live cityscape video feeds behind talent. This arrangement is often configured so that the screens appear to be windows with the live video feed visible, with structural elements strategically placed to both hide the seams between monitors and continue the illusion of a window. One important factor to remember when opting for this setup is to ensure the quality of the video feed is high quality and not “gained up” too much, which can be quite glaring on screen. 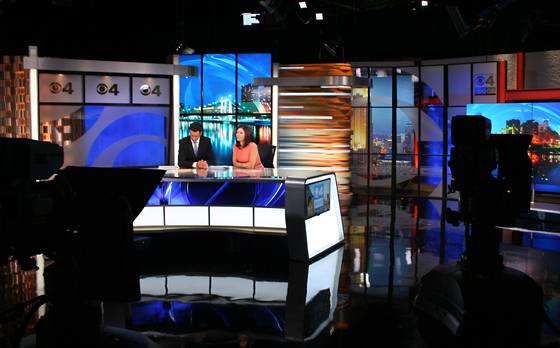 Despite the drive toward more modern, contemporary design, the use of wood tones still remains popular on TV news sets, especially when designers want to create a warmer, more intimate feel. For a brief period it did seem as though wood tones had fallen completely out of favor, with designs using solid swathes of neutral colors for walls and other surfaces.